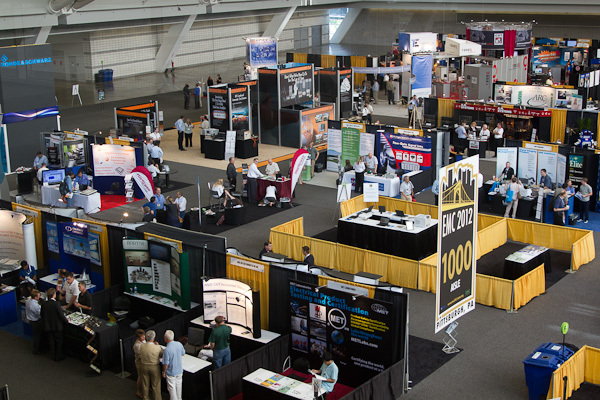 The annual International Symposium on Electromagnetic Compatibility was held in Pittsburg this year. As ever, I captured the event photographically, with the help of team members Tom Fagan, Jerry Ramie and Richard Georgarian. Although, tough at times, I also tried sitting in on several technical sessions, as well as meeting with a number of vendors. Here’s a quick synopsis, but for more detail, please check out Part 1 and Part 2 of the full report in The EMC Blog at Test & Measurement World. The convention center in Pittsburgh is huge – so much so, that I’m sure I ended up walking a couple miles a day during the week there. Fortunately, I was able to rest occasionally in the volunteers office, which was situated near the middle of activity. There were several new products of note. Dutch Microwave Absorber Solutions (DMAS) has introduced a high performance and environmentally friendly polystyrene microwave absorber that will cover the frequency range 30 MHz to 40 GHz. EM Software and Systems, inc., was there demoing their electromagnetics simulation software called FEKO. It’s useful for modeling antennas, radar cross-section, RFID, SAR, EMC, etc. 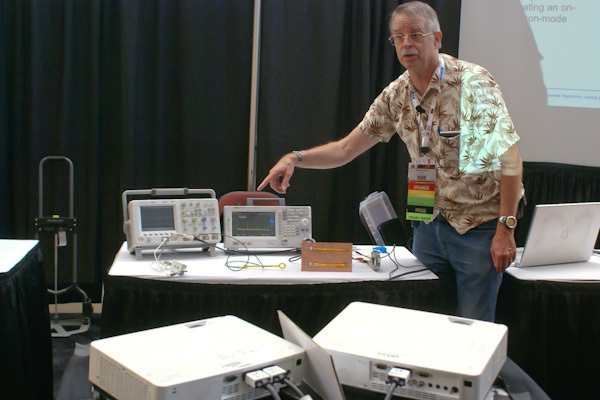 Gauss Instruments was demoing their new wide-bandwidth (up to 162.5 MHz at a time) time domain EMI analyzer, the TDEMI 40G, which measures from 10 Hz to 40 GHz. Dudley Kay, from SCITECH Publishing, Inc., was there with a number of technical books for sale. He was also actively looking for EMC-related authors. The convention center offered a nice aerial view of the vendor area. As far as the technical sessions, Henry Ott again moderated the popular EMC Basics workshop on Monday, which was very well attended. I was also a part of a half-day workshop, “EMC Consultant’s Toolkit”, which was the best-attended session on Friday. We covered lots of business aspects and pitfalls of working as an independent consultants, providing the attendees with a host of knowledge to consider. I also included a short presentation on low-cost tools and equipment when you’re just starting out. We wrapped up with a panel discussion shown below. The EMC Consultant’s Toolkit workshop had the highest attendance during the Friday workshop sessions. Shown are presenters (L-R) Jerry Meyerhoff (moderator), Bill Kimmel, Lee Hill, Kenneth Wyatt and Patrick André. Photo by Richard Georgarian. The hardware experiments are always a popular event and this year was no exception, as we had several excellent presenters. One of my favorites is Dr. Tom Van Doren, who gave a couple demos; one on cable shielding and one on magnetic (low-frequency) shielding materials. I presented a new one on the effect of a high-frequency trace over a split return plane and showed how the result generated high levels of common-mode harmonics in attached cables. Here I am demonstrating common-mode emissions generated by a high frequency trace over a gap in the return plane. Photo by Richard Georgarian. The youth program was run by Amy Pinchuk this year and sixteen kids got to build shortwave receiver kits, as well as hear about ham radio from ARRL RFI expert, Ed Hare, along with a presentation on mobile electronic devices and why EMC is important for proper operation, by ETS-Lindgren engineer, Garth D’Abreu. They also had a nice tour of the vendor area. After-hours social events scheduled included a really cool welcome reception at the nearby John Heinz History Center. Heinz was an avid collector of early memorabilia from Western Pennsylvania and Pittsburgh, in particular. 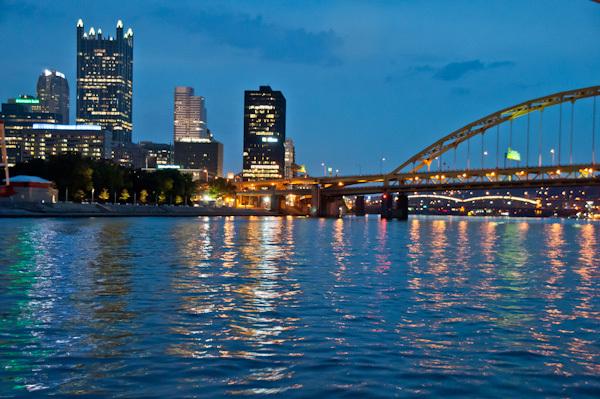 The Wednesday Gala was a dinner cruise along the rivers bordering Pittsburgh. Pittsburgh, “city of bridges”. Photo by Tom Fagan. I guess that’s a wrap until next year, where it will be held in Denver, August 5-9, 2013. For more info, click here. Hope to see you all next year. This entry was posted in General, Seminars and tagged EMC Symposium. Bookmark the permalink.